The latest issue of The Objective Standard was recently posted online. In it, Ari Armstrong and I replied to a letter from Walter Hudson on our essay in defense of abortion rights. Hudson is a writer for PJ Media and the chair of Minnesota's North Star Tea Party Patriots. For the full story, first read Ari's and my essay: The Assault on Abortion Rights Undermines All Our Liberties. 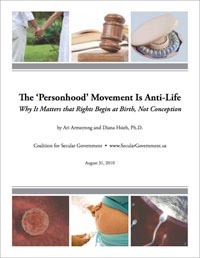 Then read Hudson's letter and our reply: An Objective Case Against Abortion? The thing I most admire about Objectivism is its uncompromising affirmation of life. No other philosophy I have encountered consistently holds thriving human existence as its chief value. I was therefore disappointed to read Diana Hsieh and Ari Armstrong's argument for an alleged right to terminate the life of the unborn ("The Assault on Abortion Rights Undermines All Our Liberties," TOS, Winter 2011-2012). In the interest of full disclosure, I confess that I am a Christian, and thus not an Objectivist. I nonetheless consider myself an advocate of Objectivism's prescriptions for civil society, and I am cognizant of the necessity for objective rational argument in the craft of public policy. Walter Hudson's letter regarding our article neglects our central argument and relies on a faulty theory of rights. Hudson rightly recognizes that the philosophy we subscribe to, Objectivism, entails an "uncompromising affirmation of life"; however, this must be understood in its proper context. Each individual properly acts to sustain and advance his own life, neither sacrificing himself to others nor others to himself. As concerns pregnancy, the key question is whether an embryo or fetus is a person with the same moral and legal rights as a born infant (in which case abortion is murder) or not (in which case abortion is a woman's right). Now... go read the whole exchange: An Objective Case Against Abortion?